A computational model for the mitochondrial respiratory chain that appropriately balances mass, charge, and free energy transduction is introduced and analyzed based on a previously published set of data measured on isolated cardiac mitochondria. Figure 1: Comparison of model simulations to experimental data on NADH, MVO2, cytochrome C redox, and matrix pH, for model without phosphate control. A. 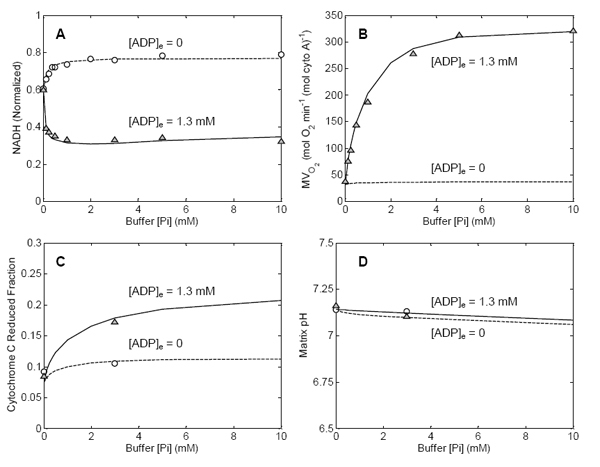 Results for normalized matrix NADH as a function of buffer inorganic phosphate concentration are shown for the two experimental cases of resting mitochondria ([ADP]e = 0, state 4) and active state mitochondria ([ADP]e = 1.3 mM, state 3) B. Results for MVO2 (rate of oxygen consumption) are shown for the same experimental cases as in A. Experimental data are not available for the resting state, in which a minimal flux through the electron transport system is maintained to compensate for cation flux across the inner membrane. C. Results for cytochrome C reduced fraction are shown for the experimental cases as in A. The black curves correspond to the model equations developed in the text. The red curves correspond to the best fit model simulations obtained with Equation (9) modified to not include the factor multiplying the expression for JC4. D. Matrix pH (model simulated and experimentally measured) are plotted as a function of buffer phosphate for the experimental cases as in A. All computed results in this figure correspond to steady-state simulations of model described in Section 2.1. Model simulations are plotted a solid lines. Experimental data (circles and triangles) are obtained from Ref. 10. 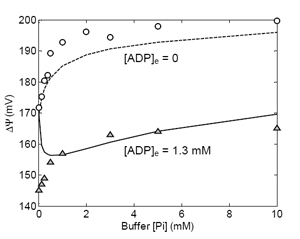 Figure 2: Comparison of model simulations to experimental data on membrane potential for model without phosphate control. 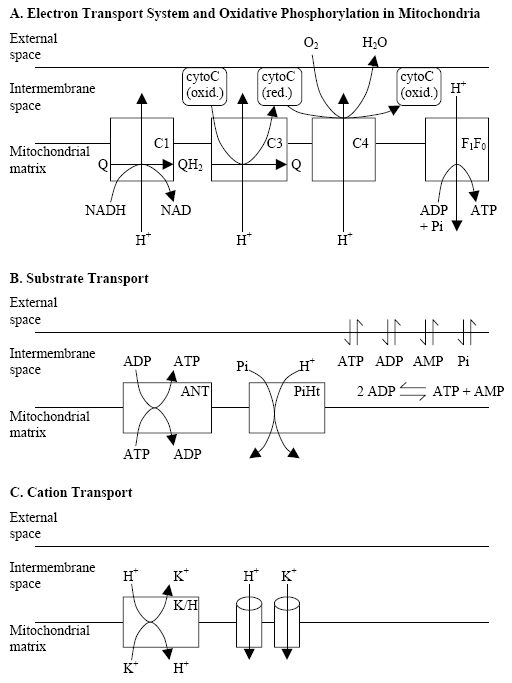 It is illustrated that the model without phosphate control is not able to fit the experimental data on mitochondrial membrane potential. Computed results in this figure correspond to steady-state simulations of model described in Section 2.1. Model simulations are plotted a solid lines. Experimental data (circles and triangles) are obtained from Ref. 10. Figure 3: Comparison of model simulations to experimental data on NADH, MVO2, cytochrome C redox, and matrix pH, for model with phosphate control. A. 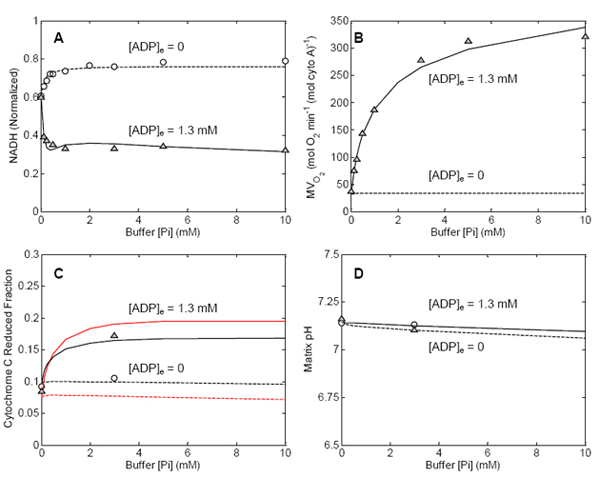 Results for normalized matrix NADH as a function of buffer inorganic phosphate concentration are shown for the two experimental cases of resting mitochondria ([ADP]e = 0, state 4) and active state mitochondria ([ADP]e = 1.3 mM, state 3) B. Results for MVO2 (rate of oxygen consumption) are shown for the same experimental cases as in A. C. Results for cytochrome C reduced fraction are shown for the experimental cases as in A. D. Matrix pH (model simulated and experimentally measured) are plotted as a function of buffer phosphate for the experimental cases as in A. All computed results in this figure correspond to steady-state simulations of model described in Section 2.2. Model simulations are plotted a solid lines; experimental data are the same as plotted in Figure 1. 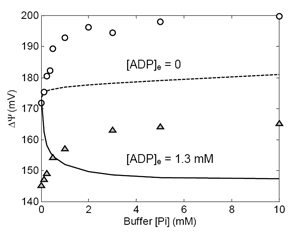 Figure 4: Comparison of model simulations to experimental data on membrane potential for model with phosphate control. It is illustrated that the model with phosphate control compares much more favorable to the experimental measurements than the model without phosphate control (Figure 2). Computed results in this figure correspond to steady-state simulations of model described in Section 2.2. Model simulations are plotted a solid lines; experimental data are the same as plotted in Figure 2. Figure 5: Behavior of model at low oxygen concentration. 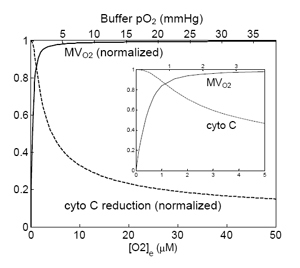 Predicted rate of oxygen consumption (MVO2) normalized to maximal rate of oxygen consumption and fraction cytochome C reduced are plotted against oxygen concentration, which is expressed in micromolar (lower axis) and oxygen partial pressure (upper axis). The oxygen consumption curve was computed for state-3 respiration, as described in Section 2.3, corresponding to experimental conditions reported in Refs. 18 and 19. The cytochrome C curve corresponds to state-4 experimental conditions reported in Ref. 17. Inset shows predicted curves for oxygen concentrations from 0 to 5 ?M.